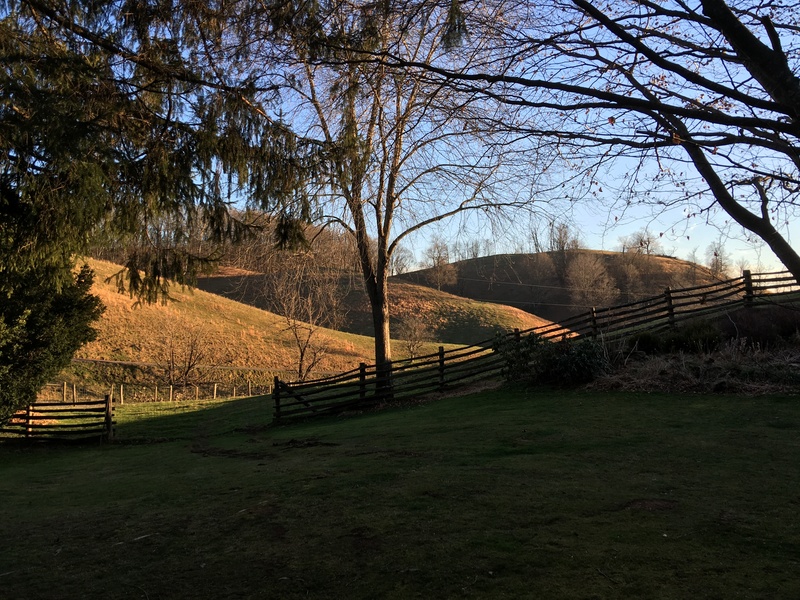 The view to Stark’s Ridge, where Lawson’s Knob overlooks Vinegar Hollow, Highland County, Virginia. Apparently it is a fact that Monet thought the Christmas rose (hellebore, also known as Lenten rose; Helleborus sp.) and the primrose, Primula sp., belong together. See New York Botanic Garden’s “Monet’s Garden: Creation, Facts & Secrets.” Monet was right, of course, because he is reported to have said “I cannot live without flowers.” So, he surrounded himself with flowers– in order to survive. I agree, though I have never been able to have a grand garden like Monet’s, but even a few flowers here and there are enough. Groundhogs in Virginia eat my snakeroot; beloved dogs in Ithaca sit on my primroses, though that has failed to kill them. So be it. My policy is share. No violence. Right now I am looking at one hellebore and one primrose, and I am glad that I’ve gotten the pairing right according to Monet. 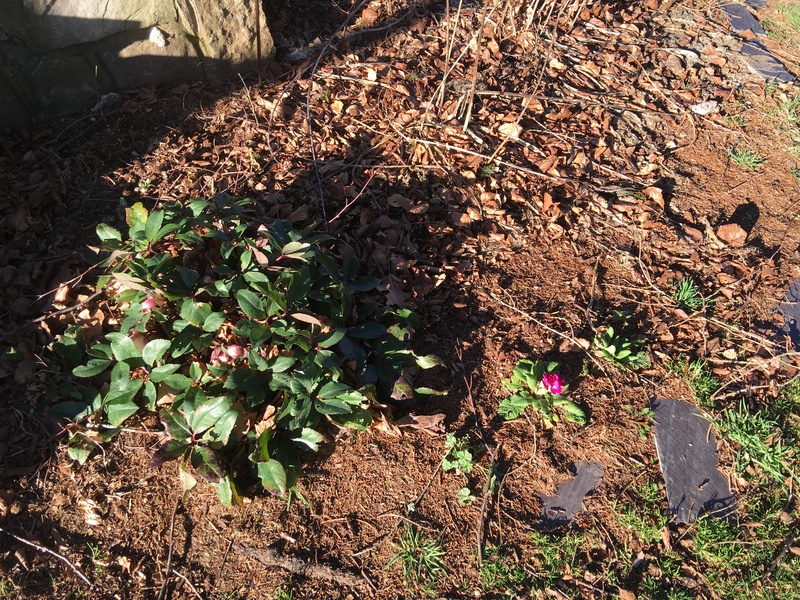 The primrose and the hellebore. I am here again in Vinegar Hollow where Angus cattle, their black bodies and white faces are silhouetted against the copen-blue sky behind the Peach Tree Hill, three bluejays are splashing in the gutter, flocks of juncoes swirl over the sinkhole, and I see the unexpected shades of pink and rose in the garden. Unexpected for the first of January. The primrose in the noon sun on January 1, 2016. This is a polyanthus, a hybrid primrose. Notice the circle of anthers resting in a golden yellow cup slightly raised above the petals at the center of the flower. This is called the rose-crown or the rose-eye. When this occurs in a thrum-eyed flower (anthers visible, stigma invisible), one has “the last word in Polyanthus elegance” according to Florence Bellis, renowned primrose breeder (APS, 1943, p. 35). It has been unusually warm here in western Virginia as in most of northeastern North America. Last year when here in the hollow I reported about reading Antarctic explorers and braving a blizzard to experience the chill. It is has been spring-like here for a month. 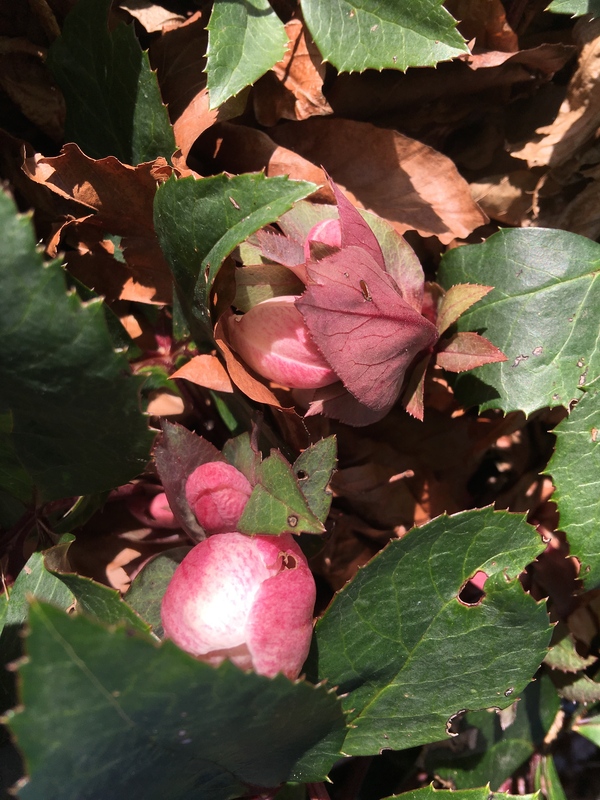 I am not surprised the hellebore is budding and even opening flowers. Every year it pops up in snow in the coldest of temperatures here in the hollow. The plant now has between 50 and 100 buds. If winter comes now, when all these buds, so delicately striated pink and white, are ready to open, what will happen? It will survive. Hellebores are tough. Buds and foliage of the hellebore. The one flower of the hellebore open in Mustoe today. The primula will survive also, though its more delicate greenery will get glassy, frozen looking if very low temperatures come. But it will survive. Primroses are tough. The primrose on January 3, 2016. I can only go back to myself. I look around myself and I see every year that, no matter what people do to themselves and to one another, the spring constantly renews itself. This is a physical fact, not a metaphysical theory. I look at every spring and I respond to it very strongly. But I also notice that every year the spring is the same new spring and every year I am one year older. I have to ask the question: what is the relation between my brief and tragic life and this force in the universe that perpetually renews itself? I further believe that every human being asks this question. We can’t have spring without winter. Winter arrives in Vinegar Hollow with a dusting of snow. Winter arrived with a dusting of snow, and tonight it will go to 13 degrees F. This feels right. I will cover the primrose tonight just to ease it into this sudden drop from 40-50 ish degree F weather to the teens. Snow continues its dusting throughout the day. Black locust in the center and old apple trees to the right are still. Second morning at 4 degrees F. Three blue jays are back with a flock of juncoes. They have spread themselves all over the lawn in the morning sun and eagerly peck the ground, perhaps finding seeds of the red spruce and the beech? There was a howling wind the night before that might have dislodged seeds. But this is just a guess. I have no idea what they are so excited about. They are tapping at the ground. The three blue jays retreat to the gutter occasionally to splash. It is hard to describe the beauty of the translucent white fan that the ends of their feathers make as they alight and depart. There is more white to the blue jay than one realizes. 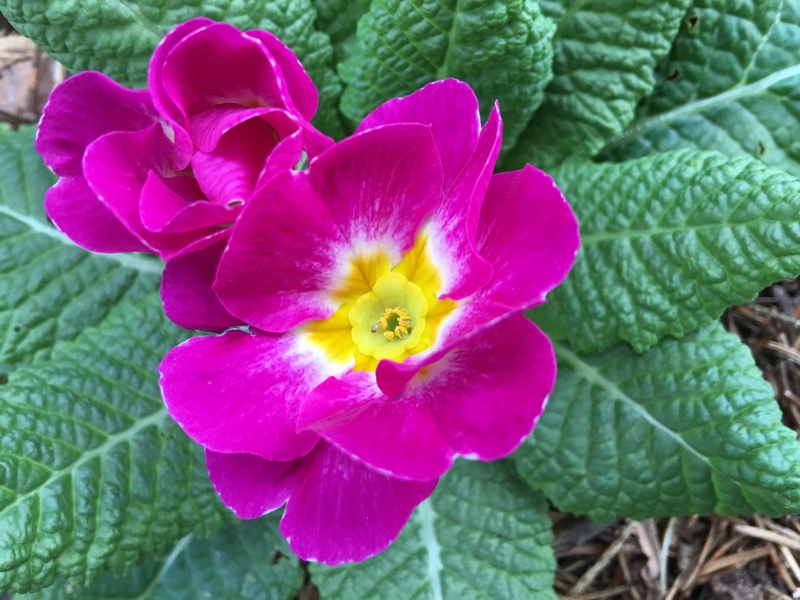 The primrose has shrunken within itself, the vigorous green departed, the vivid rosy pink now a troubled purple. 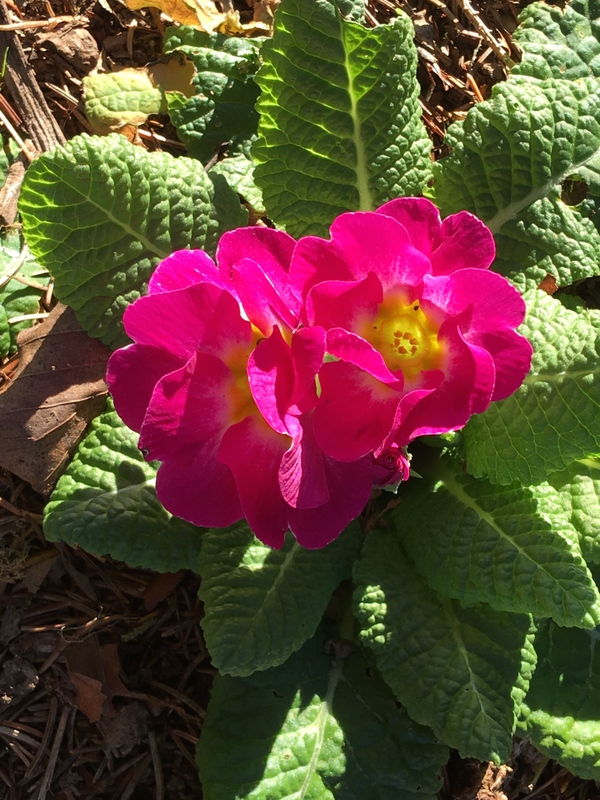 There were no pollinators for it, but a primrose lover has seen a “ros” in winter. p.s. 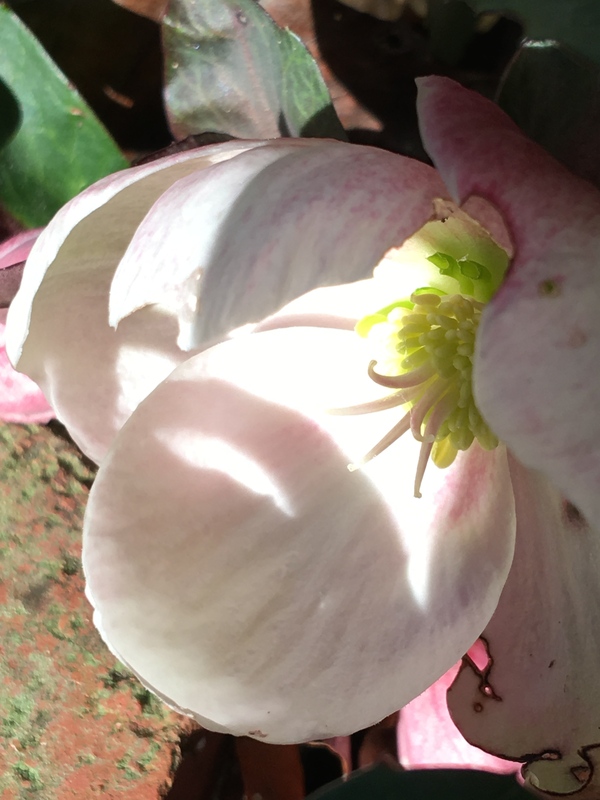 The hellebore is a really extraordinary variety called Helleborus x ballardiae ‘HGC’ ‘Pink Frost.’ I lose my plant labels, or maybe I can blame it on the dogs, but this label I saved in my writing desk. It certainly can handle the ultra cold. Interesting post and outstanding photos! Mike Humphries suggested I contact you in regard to the forestland that your son Jack has purchased in Highland county. He said Jack may be interested in harvesting some timber, especially in response to the recent increase in gypsy moth populations. Please feel free to contact me at your convenience if I can be of any assistance. Lovely to hear from you, Keith. Do you remember the “tall campanula” (Campanula americana) we found over in that timbered land on Dickson’s Hill? It found its way a few years ago to Vinegar Hollow! I will refer Jack to you. Thank you!